To everyone who came to City Hall yesterday, helped spread the word, organized, testified: THANK YOU! Filling the City Council chambers with around 100 people, on a Wednesday during work hours, sent an unmistakable message to Mayor Rawlings and all Council members. Others have summarized the briefing better than I could, so here are a few things to read. 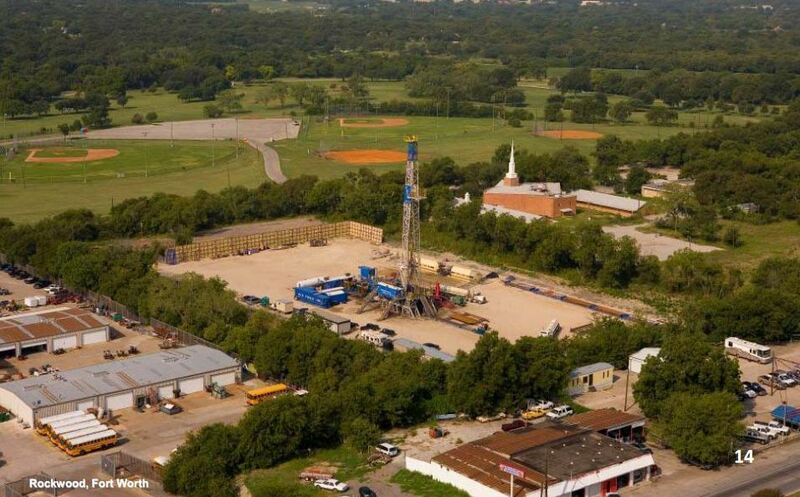 The picture of the day came courtesy of the gas industry representative presentation: “A typical drilling site” literally adjacent to baseball fields and a church. Is the the Dallas you envision? Dallas municipal law attorney Terry Welch was coming to the end of his presentation on why the recommendations from the city’s task force should be strengthened: If we’re wrong and fracking turns out to be completely safe, then you can always come back and liberalize strict regulations. But you can’t undo the damage once drilling takes place with insufficient safeguards. Err on the side of public health and safety. And with that, 90% of the packed room erupted into at least 60-90 seconds of continued and loud applause. Those skeptical of drilling thought the city task force was too soft on drilling. Dallas lawyer Terry Welch, who served on the task force but was not speaking for it, presented their case. Deputy Mayor Pro Tem Tennell Atkins asked the question that might best sum up the job before the council. How, he asked Welch, is safety determined for a drilling operation? Would drilling at City Hall be an unsafe activity? Welch didn’t miss a beat. “There are a lot of unsafe activities that go on at City Hall,” he said. The dueling presentations the council and the audience heard amounted to a grim, four-hour slog through the same arguments that plagued the council-appointed gas drilling task force for months. Should the council allow drilling in the city’s parkland or floodplains? How many feet of setbacks should separate drilling operations from businesses and homes? Is fracking even safe? Who the hell knows? We’ll keep you informed about the next steps going forward of course. But if yesterday was any indication, we’re on the right track. Now’s a great time to contact Dallas officials and send your message again.